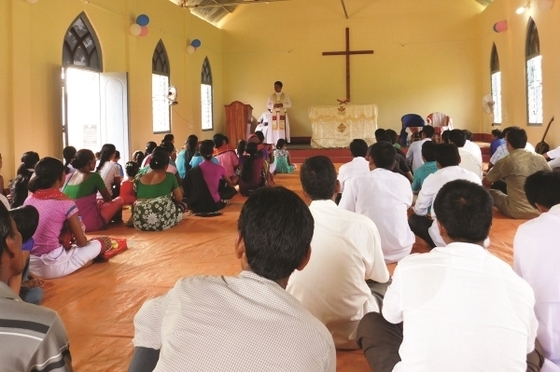 As Raju helped to build this worship place, he learned more about Christ. After God miraculously healed his son, Raju began to worship God for himself—in the building he helped construct! Raju rushed to Chinnam’s house with his 3-year-old son’s feverish body heavy in his arms. When this crisis came, he knew exactly where to go. The village had known for years that God had healed Chinnam’s wife when she was afflicted by an evil spirit. A GFA-supported worker had prayed for her, and she was completely restored. Just recently, Raju had been hired to work on the construction of a worship place for the congregation that was birthed from this miracle. He heard other stories of God’s great power, too. Maybe this God would heal his son. As he approached Chinnam’s house, fear and hope wrestled in his heart. Chinnam and his family gathered around the small, restless body burning with fever. They cried out to the Lord for His healing hand to visit once again. The boy grew quiet. He drifted into a deep sleep as his fever broke. What started for Raju as just another construction job to support his family ended in seeing God’s healing hand. Today he worships in the very church he helped to build.